The perfect dinner for a cool winter evening, I adapted this recipe from one I found in the Jan/Feb 2014 issue of Cooking Light. It looks like a lot of ingredients, but the cooking is quick. It’s tasty and simple – my husband put this dish together to give me the night off! Place tofu on several layers of paper towels and cover with more paper towels. Let the tofu drain for about 30 minutes. Heat pan with 1 tblsp oil. Add tofu and saute until golden brown. Remove tofu. Reheat pan and add 2 tblsp oil, peanut butter, curry paste, cumin, and coriander. Cook for about 15 seconds. Add coconut milk, soy sauce, and sugar. Add squash, bell pepper, and shallots. Bring the mixture to a boil. Then reduce heat and simmer for about 15 minutes or until squash is tender. Stir in tofu, lime rind, and juice. Serve over rice with basil leaves as a garnish. This week’s recipe comes from a recommendation by my friend Lisa Muras. Lisa is a dietician and always on the lookout for tasty, healthy recipes. She found this recipe in the Washington Post. Lisa recommends serving the dish over pasta. The only change she made was using a blender on the lowest setting, rather than a food processor. Enjoy! Combine the lentils, carrots and water in a large pot over high heat. Bring to a boil, then reduce the heat to low; cover and cook until the lentils are tender, 20 to 30 minutes. Meanwhile, pour the oil into a medium saute pan over medium heat. Once the oil shimmers, add the onion and stir to coat; cook until translucent, 5 to 8 minutes, stirring occasionally. Add the bell pepper and garlic, stirring to coat; cook until tender, 4 minutes. Transfer the mixture to a food processor. Once the carrots and lentils are cooked, transfer the carrots from the pot to the food processor, along with the tomatoes or tomato puree, oregano, basil, crushed red pepper flakes and kale. Pulse until mostly smooth. Add the quinoa and red wine to the pot of lentils, stirring to incorporate; cover and cook until the quinoa grains start to show their white tails, 6 or 7 minutes. Stir the carrot-kale puree into the lentil-quinoa mixture; cook, covered, over low heat until the sauce melds and heats thoroughly, about 20 minutes. Season with the salt and pepper. Adapted from "The Great Vegan Bean Book," by Kathy Hester (Fair Winds Press, 2013). So you slept through science class part 10–What’s an “invasive non-native”? In previous posts we’ve talked about ecosystems and the role that each species plays in an ecosystem. Over thousands of years, species in an ecosystem evolve together. An example of this “co-evolution” would be insects that begin to come out of winter sleep at about the same time that flowers begin to bloom – this coordination ensures that the insects get nectar for food and that the plants get pollination. When these native species evolve together, this type of coordination helps the ecosystem to remain healthy. Sometimes, new species that didn’t evolve in the ecosystem are introduced. These species would be considered non-native. Here in the Chesapeake Bay region, we often consider any species that was introduced after Europeans arrived in the area (let’s say the 1600s) to be a non-native. Some non-natives stay where they’re planted and really don’t cause much trouble – plants such as roses, tomatoes, or tulips are non-natives. Sure, non-native species may not be the greenest option, since they require more water or fertilizer than natives, but they aren’t quite the problem that their cousins the “non-native invasive” are. Good news though, birds may be helping with reducing this insect species. Never set an unwanted pet (such as a snake) loose into the environment. Check with a local nature center for proper ways to find them new homes. Be sure to "Like" greenmomster on Facebook for all the greenest updates! It’s portobello mushrooms this week! This recipe is adapted from Michael Symon’s 5 in 5 cookbook (I highly recommend treating yourself to a copy of this cookbook!). The main change I made was cooking the mushrooms and onions in a frying pan, instead of grilling – for this method, you can use a little less liquid than the grilling option, but it works well just the same. I made some of the sandwiches with blue cheese and some without for my non-cheese loving family members – still a hit either way! Whisk oil and vinegar together and drizzle over mushroom and onion (if you’re using the frying pan, drizzle while the mushrooms and onions are in the pan so that you can cook using the liquid). Season with salt and pepper. Cover and cook mushroom and onions for about 3 minutes. Flip and cook another minute or so (until mushrooms are soft). If you’re using the frying pan, remove mushrooms with a slotted spatula. Place mushroom on roll and top with cheese and arugula. She sells seashells by the seashore, but should she? OK, I absolutely hate reporting on this study, because I love collecting shells at my favorite beaches – Edisto Island SC and Bull Island SC. Every year I make a frame decorated with some shells and put my kids’ vacation picture in it. I still think it’s a great alternative green souvenir (as opposed to many other items I don’t need that have been shipped long distances and end up in a closet). But alas, a new study reports that there might be a negative environmental impact to tourists collecting shells. The study, in PLOS One and reported on in Conservation Magazine, included surveys of a beach in Spain. Researchers found a significant change in the number of shells after the only factor that had changed was tourism (urban development, fishing, weather, wave action didn’t change significantly). Shells provide shelter for many sea creatures and birds often use them to build nests. So I guess we should keep our eyes on this research and maybe agree to take home fewer shells next year. In endangered species conservation, as in many aspects of life, the good looking individuals have a leg up on the competition. We often choose to protect the attractive species, while ignoring the species that aren’t as eye-catching. As Dante Alighieri once said, “Beauty awakens the soul to act”. But in conservation, we need to look for beauty in non-traditional packages. A recent article in the Huffington Post, “11 Animals We May Allow To Go Extinct Because They’re Not Cute and Fuzzy” shines light on a serious issue – the public’s focus on only those species that we find physically beautiful. We know, from our previous science class posts, that each species has an important role to play in the ecosystem – the species fills a “niche”. Many species needing conservation aren’t exactly the Sports Illustrated swimsuit models of nature. Species such as the Lord Howe Island Stick Insect, the Golden Poison Dart Frog, the short-tailed albatross, and the pygmy three-toed sloth all play important roles in their ecosystems and require species conservation efforts. 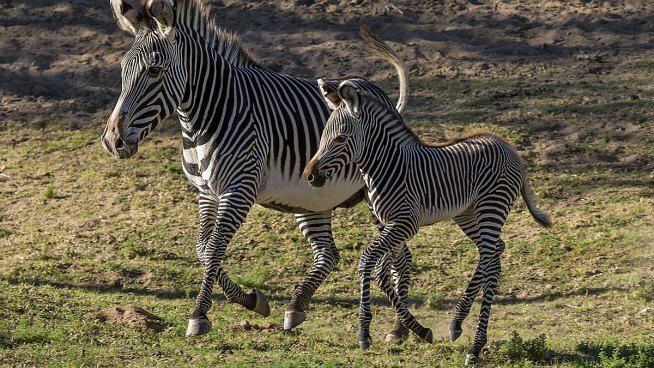 Niches should be our basis for preservation (and volunteering and donating), rather than the animals’ cuteness – be sure to check out the article to learn more about the species. 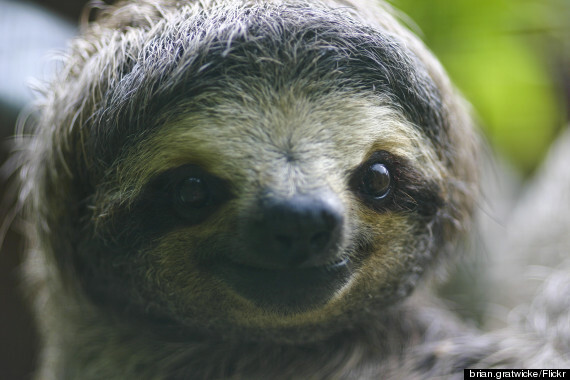 But that pygmy three-toed sloth is pretty cute (photo credit: Huffington Post)…. Be sure to “Like” greenmomster on Facebook for all your meat-free Friday recipes! Time again for breakfast for dinner! 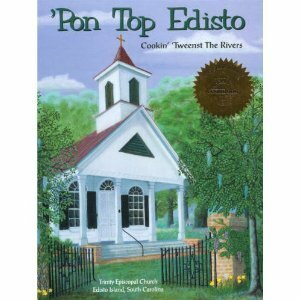 This delicious dish was adapted from a recipe by Gale Belser in ‘Pon Top Edisto, a cookbook from the Trinity Episcopal Church in my favorite vacation spot – Edisto Island SC! The recipe is easy AND it’s a crowd-pleaser – what could be better than that? Pour half egg mixture into baking dish. Spread spinach in a layer on top. Pour second half of egg mixture on top of the spinach. Greenmomsters, we need your vote! As you know from reading this blog, our family spends a good bit of time each year volunteering at Sky Meadows State Park, our favorite Virginia state park. The Virginia State Parks system is hosting a “First Day” photo contest and we need your help to win! 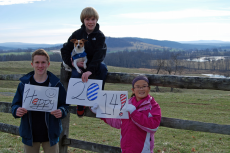 We’ve submitted our photo, taken at Sky Meadows on January 1. Now all we need is for all of you greenmomsters to vote for our photo at this link one time per day until January 10. We really appreciate your support!